Monday Morning Secret Wars 6: OK, it’s Tuesday, sue me. Yeah, yeah, tell it to your audience, Dumbo. Marriage-related passive-aggressiveness! Here’s my $4, Marvel! Why does this story exist? I’m really left scratching my head. First of all, from a corporate, Marvel editorial viewpoint, I have no idea why Marvel would pick at a scab that had healed over years ago. When Joe Quesada decided that the Spider-Marriage should end because it was a creative hindrance, fanboys (myself included) decried the move as a cop-out. It didn’t help that the story vehicle used, One More Day, was an out-and-out mess, with the writer of the title having submitted a script that supposedly didn’t match all of the story endpoints that were agreed to by Marvel. The script had to be rewritten on the fly to get the book out the door, and it showed. But then, Marvel won the argument. The long arcs that followed, Brand New Day and the epic Dan Slott run that included Big Time, Spider-Island, Superior Spider-Man, and Spider-Verse, showed that yes, Marvel wasn’t kidding around when it said that there was a world of stories that could be told with a freer Spider-Man. The book has been on a sustained creative high since MJ whispered those words into Mysterio’s ear. Marvel decided to go al out on this book, with top creators Slott and Andy Kubert. In this book,the Spider-Marriage was never annulled and Peter and MJ are married with a kid named Annie. And that would be fine- and fun- if it wasn’t for the other baggage assigned to Peter in the story. Not only does Peter have to fight out an escaped Venom who views his kid as the best way to get back at Spidey, but every hero in this Battleworld region gets annihilated by a new super-baddie, Regent. In response, Peter does two things that would make Uncle Ben cringe- he kills Venom, and he retires from the webs, deciding that his responsibility is really for his wife and daughter. It’s a bad story, and it shouldn’t have been. Slott and Kubert are amazing creators, and I expected a better story than what I got. And that’s without touching the question of why God Doom would create a Battleworld with giving Peter Parker back his marriage in the first place. In current Marvel continuity, the decision to sacrifice Peter and MJ’s marriage was wiped out of the minds of everyone. Mephisto might remember, but he isn’t around. Peter doesn’t remember, and we really don’t know if MJ does. 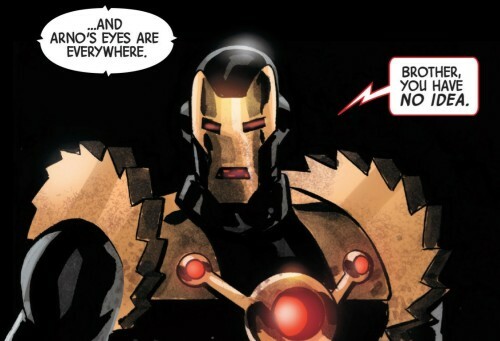 So how did Doom even know about OMD to create this Battleworld? 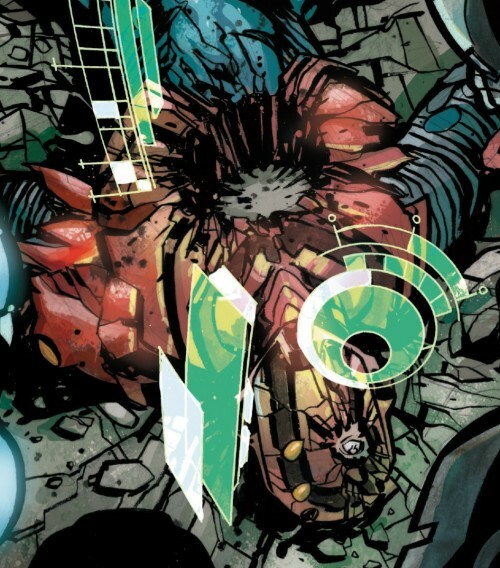 It’s a strange question, and it’s not the only one of its kind in the Secret Wars crossovers. 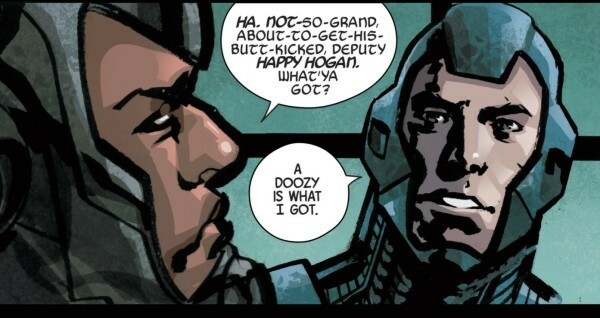 Wait- is that “Happy” Hogan? Did someone remember that Happy is an integral part of the Marvel U, and should be brought back? Oooh, Arno Stark razor shoulders. Always cool. I love those things. –and you punched a hole through Spider-Man as your cliffhanger. Did you know people love Greg Land? That people think that he’s one of the best artists at Marvel, and possibly in all of comics? 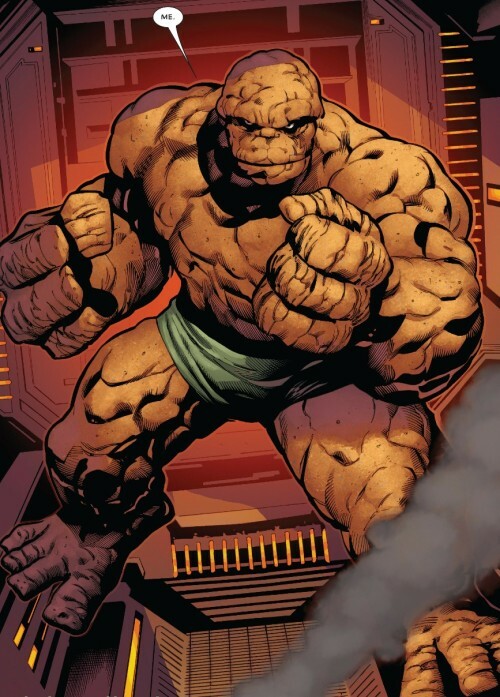 He can draw a heck of a Ben Grimm. Never mind the flaws in the picture- I mean, he’s floating! His right foot makes no sense in relationship to the background! But that is a DAMN good looking Thing. Tie goes to the runner. Also, Peter David is writing the Maestro, the older, cynical, corrupt Bruce Banner. And he’s fantastic here. 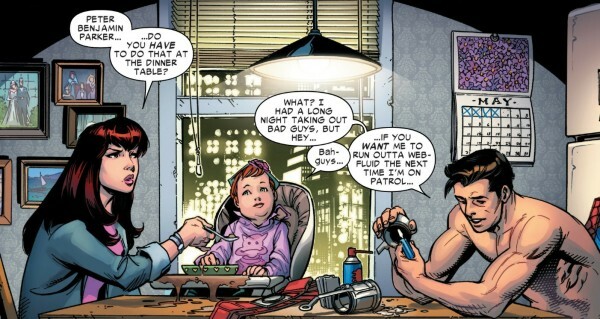 I loved the original Future Imperfect, and this issue is almost as much fun. Every mega-crossover usually has an epilogue book that tries to put a funny spin on the whole thing. Without it, we wouldn’t have books like Ultimate Civil War: Spider-Ham #1 or Blasters. But during the crossover? It’s a little weird, and a bit excessive (especially with two Deadpoool books also coming out during the same time). Skottie Young is an immensely talented artist, and if you like his stuff, you’ll like this book. It does have some funny moments, and by my standards, it deserves a thumbs-up. But I am a bit weary of all the forced humor going on here. but Marvel didn’t stop, it’s like they had a disease. Okay, that’s it, I’m done with this joke. Sorry. I apologize. If you like late 80’s X-Men, you’ll like this book. Good plot, nice art, exactly what you want. And no bad parodies of “Children’s Story.” That’s on me. Sorry. I’m down to ten books! Yay! Wait- tomorrow is new comics day? Next Next post: Monday Morning Secret Wars 7: Come and get me, you mugs!